Opportunity charging allows you to do all of this without the added cost of battery modification or expensive upgrades to your buildings electrical infrastructure. Best of all, with Infinity high frequency chargers, you’ll be storing more of the energy purchased from the utility company in your battery. 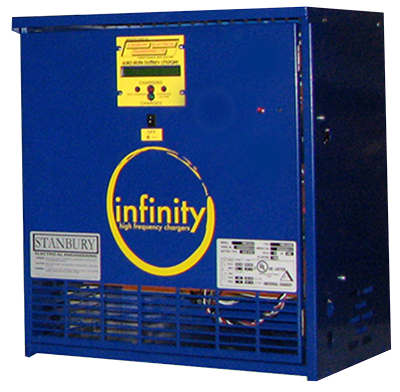 Infinity high frequency chargers utilize a full bridge IGBT switch mechanism to create the purest DC output available from an industrial battery charger today. The ZIP charger PEI profile gives the ability to adjust to different applications and environments. It also prevents excessive gassing during operation; this means opportunity charge plugins while the battery is fully charged will not lead to premature loss of active material. dV/dt dl/dt control termination ensures proper recharge without the waste of energy or demand to a battery caused by improper charge return.